Ryan had his middle school choir concert this week, and it came off without a hitch. There my son stood, with all his classmates, stock-still on the risers singing four holiday-themed songs. He was an active participant, singing with emphasis and wanting to do a good job. This no longer surprises me, but it wasn’t so long ago that I dreaded these events. I remember attending his first-ever musical performance, a recorder concert in elementary school a few years ago. Back then, the idea that my son could stand still, follow directions, and attend at an activity that was not his favorite interest seemed beyond his capabilities. I remember seeing him march in and take his place in the back row. I recall wondering how he would make it through without losing focus and attention. But he surprised me that day, and he keeps defying expectations. At last year’s event he even sat through a lengthy wait for the concert to begin without issue. Ryan has an excellent signing voice, but he has shown no interest in pursuing music. Rehearsals for this year’s show required him to miss gym, one of his favorite activities. There were other wrinkles that worked against this being a positive experience. He had to dress up, including wearing a tie for the first time in his life. Yet, concert day arrived and Ryan offered no objections. He made no effort to get out of it. He willingly got dressed in his dress pants, white shirt, and tie. He didn’t protest when it was time to leave. We dropped him off at the designated area a full half-hour before the show. Ryan’s aide was there waiting, a pleasant surprise since this was long after school hours. Ryan was in a good mood as we departed, although seeing him sit apart from other kids was not easy to watch. We wished Ryan well and prepared to go find seats, but first there was a problem. The concert was choir followed by orchestra. Ryan would be done after the first part. The event program instructed parents not to pick up kids until after the entire performance. Ryan would have to wait after he finished. Knowing this would be an issue, I told him. I did not want there to be a scene if he only found out after he finished singing. He immediately protested. As his voice was rising, his aide stepped in and told us we could pick him up early. Thankful for that, we left to take our seats, choosing ones on the aisle so we could make a discreet escape between choir and orchestra. Out Ryan marched to take his place on the risers. None of our fears were realized. His tie remained in place. His shirt was still tucked in. He was standing patiently. As the concert began, he was an eager participant. The show lasted perhaps 15 minutes and four songs. As soon as the students had left the stage, we made our way to the pickup room. We were hardly alone. I guess my son isn’t the only one with an issue waiting. I think the best part of the experience was this: Despite his relative lack of interest, Ryan was proud of himself. He was proud of how he looked in his dress clothes. He was proud of how he had sung. He was proud that nothing had distracted him. He told us he knew he would be getting a good grade in music because of his effort. Ryan has always respected school authority and expectations. Whatever behavioral issues we have dealt with come at home, not at school, where he is motivated to attend, follow rules, and achieve, whether on a science quiz or a choir concert. There was one consequence to Ryan’s participation in the show. The next morning, determined to “make up” for having to wear dress clothes, he wore a San Jose Sharks t-shirt under a Sharks jersey and a Sharks hat. He wanted to make sure everyone knew that he was a hockey fan first and foremost even though he had dressed nicely and performed in the concert. As if there was any doubt. I’ll take it. These small accomplishments, with the once-difficult becoming routine over time, are how we mark Ryan’s progress. There are still many challenges — the image of him sitting alone while all the other kids interacted in the waiting room is not one I will soon forget — but I can’t let them discount the pride I take in even minor accomplishments. Seeing him take pride? That part is a pleasant surprise. I just ran across your blog the other day, so i’m still “getting to know you” – Your son seems to share a few issues with mine, though we’re ahead of you on the curve. I wish i had the hocky connection you have, mine is dyspraxic so sports never really came into the picture. Oddly, i find myself envying you for the battle you don’t have to fight – I’m so happy that Ryan respects authority. The complete lack of respect for school authority in particular is a battle we’ve been fighting for years (along with the inability to “filter” what he’s thinking, and you have a recipe for disaster every day). Thanks for reading and commenting. We are quite lucky with Ryan in many, many regards. One of the things we have always been grateful for is his respect for school authority. It was one of the main reasons we went for years and years without trying medication- because he could attend at school. And no I don’t find that odd at all. 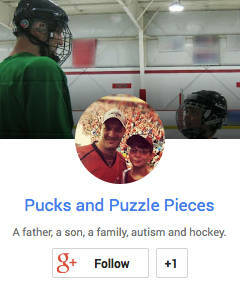 I hope you and your son are lucky enough to find a topic or interest on which you can connect. Can i ask what meds you’re using? We’ve had some good results with Guanfacine. We’re generally minimalists when it comes to that sort of thing, but this does make the difference between a kid who just gets baby-sat and a kid who can keep up with high school classes. Next year I want to go hear him. Or at least you have to tape it for me. I am so proud of him. And how handsome!